In an effort to help restore populations, "bluebird trails" are being installed statewide. 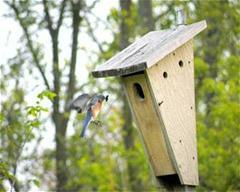 Engel Conservation Area has a bluebird trail consisting of 11 nesting boxes. Hundreds of bluebirds have been produced here since they were established! The purpose and mission of BRAW is to monitor and increase the production of the Eastern Bluebird and other native cavity-nesting birds through a coordinated statewide nest box construction and monitoring program. 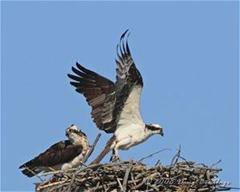 Bald Eagles have been successfully nesting along Big Muskego Lake since 2007. Although no longer listed as endangered or threatened, the occurrence of eagles in southeastern Wisconsin is remarkable. 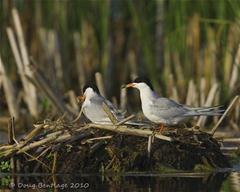 This is the first documented nesting in Waukesha County in over 50 years. Fairly common in northern Wisconsin, eagles migrate to overwinter in areas of open water along major rivers, or south to the Atlantic or Gulf coasts.